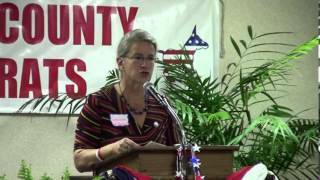 Valdosta, March 3, 2014 —The Lowndes County Democratic Committee voted Saturday to oppose the Sabal Trail Methane Pipeline slated to run through Lowndes County. The Sabal Trail Pipeline is proposed to move Liquid Natural Gas (LNG) from fracking sites to Florida. Fracking is a known polluting technique, leaving behind undrinkable water and unusable earth. Florida is the Sunshine State and could generate any needed electricity from less expensive and more environmentally friendly renewable sources of solar and wind. Georgia Democrats believe in and uphold every citizen’s right to equal and impartial justice under the law. The taking of privately owned property by a private company is a property rights issue. Putting corporations above citizens is not equal, nor is it impartial. Lowndes County property owners have a right to say who can and cannot use their property and a LNG pipeline that benefits no Georgians is a property rights violation. Existing pipelines have a history of failures from poor monitoring and maintenance which have resulted in explosions, fires and deaths. The safety of Lowndes County citizens should be a top priority of our local and state governments. The Committee urges citizens to attend the Federal Energy Regulatory Commission meeting on Tuesday, March 4th at 6:00pm at the Holiday Inn at 1805 West Hill Avenue Valdosta, GA 31601 and express their opposition to this pipeline. The Lowndes County Democratic Party promotes development of Party organization and activities, seeks and encourages qualified candidates for public office, supports Democratic nominees, performs such election functions as are required by law, maintains appropriate records, promotes and adds logistical support to the State Affirmative Action program, and raises funds for the above purposes.